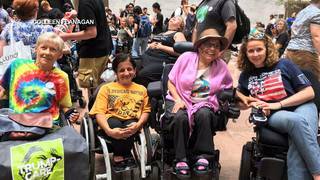 Disability Rights Activist Arrested for Protesting Trumpcare: We Won’t Be Silent While You Kill Us | Democracy Now! disability rights attorney with Americans Disabled Attendant Programs Today (ADAPT). With the deeply unpopular healthcare plan having failed to come to a vote before the Senate recessed for the holidays, demonstrators across the country flooded the offices of Republicans in what they’re calling a “last stand” to prevent a repeal of the Affordable Care Act. We speak with disability rights attorney Stephanie Woodward, who was shown in a viral video being pulled out of her wheelchair and arrested for protesting outside Senate Majority Leader Mitch McConnell’s office. AMY GOODMAN: President Trump urged the Republican Congress today to repeal the Affordable Care Act, even as senators recessed for the holidays early yesterday, with no plans in sight to vote on a replacement healthcare bill. In a tweet early this morning, President Trump tweeted, “If Republican Senators are unable to pass what they are working on now, they should immediately REPEAL, and then REPLACE at a later date!” unquote. Senate Majority Leader Mitch McConnell called off a planned vote on the Senate healthcare bill after some members of his party balked over a Congressional Budget Office report that found it would add 22 million Americans to the ranks of the uninsured. Other Republicans said they’d oppose the Senate bill because it doesn’t go far enough. Meanwhile, support for a nationwide single-payer healthcare system is growing. Massachusetts Senator Elizabeth Warren became the latest politician to back single payer. In an interview with The Wall Street Journal Tuesday, Warren said, quote, “President Obama tried to move us forward with health-care coverage by using a conservative model that came from one of the conservative think tanks that had been advanced by a Republican governor in Massachusetts. Now it’s time for the next step. And the next step is single payer,” she said. Billionaire investor Warren Buffett also came out in favor of single payer this week, saying, quote, “We are such a rich country. In a sense, we can afford to do it,” unquote. A recent poll by the Pew Research Center shows a full third of Americans are now in favor of a national single-payer system. However, on Friday, California Assembly Speaker Anthony Rendon shelved a proposal to establish a single-payer system across California, saying the bill will not be voted on this year. The struggle over single payer comes amidst widespread backlash and protests against the Republicans’ healthcare plan, which the Congressional Budget Office says would cause 22 million Americans to lose their health insurance over the next decade. In Washington, D.C., Planned Parenthood staged a People’s Filibuster against the legislation Tuesday. The protest included dozens of women dressing in red cloaks and white bonnets, inspired by the dystopian novel and TV series The Handmaid’s Tale, about a totalitarian theocracy which overthrows the U.S. government and imposes power by subjugating women and controlling their reproductive rights. On Capitol Hill, demonstrators flooded the offices of several Republican senators in what they called a “last stand” to prevent a repeal of the Affordable Care Act. At a sit-in protest at the offices of Pennsylvania’s Pat Toomey, protesters chanted, “Kill the bill! Don’t kill me!” Similar protests targeted Senators Tom Cotton of Arkansas, Marco Rubio of Florida, Rob Portman of Ohio, Lisa Murkowski of Alaska, where they were met by Murkowski’s aide, Kevin Sweeney. KEVIN SWEENEY: Senator Murkowski is a very deliberate senator. Senator Murkowski—and she’s shown us in the past. She’s shown us in the past that she wants to do what’s right for Alaska. But she needs to know exactly what it is that she’s doing. She wants to know what the impact of this is going to be on Alaskans. PROTESTER 1: It’s going to kill people. It’s not hard to figure out. PROTESTER 2: Remove 22 million Americans from their insurance. PROTESTER 3: This bill already has actuarial tables attached to it, as, obviously, drafts, that show the only way these numbers come about, through the CBO, is if people die early. AMY GOODMAN: During Wednesday’s protests, police arrested 40 people on misdemeanor charges of unlawful crowding and obstructing. Meanwhile, activist disability rights group ADAPT launched a two-day-long sit-in at the office of Colorado Republican Senator Cory Gardner, staging a die-in and chanting, “Better to go to jail than die without Medicaid.” Ten activists with ADAPT were arrested Thursday. For more, we go to Washington, D.C., where we’re joined by Stephanie Woodward, an organizer with ADAPT. Video went viral of her being ripped from her wheelchair and arrested for protesting outside Mitch McConnell’s office. She has now been arrested while protesting 14 times. Let’s go to that video clip of Stephanie Woodward being arrested. STEPHANIE WOODWARD: No cuts to Medicaid! No cuts to Medicaid! No cuts to Medicaid! No cuts to Medicaid! No cuts to Medicaid! AMY GOODMAN: Stephanie Woodward’s recent column for Vox is “I was pulled out of my wheelchair by police. It could be worse. Trumpcare could pass.” She joins us now from Washington, D.C., an organizer with ADAPT and a disability rights attorney. Welcome to Democracy Now!, Stephanie. Talk about what happened. STEPHANIE WOODWARD: Well, a bunch of disability rights activists from ADAPT, about 60 of us, went to Mitch McConnell’s office. Many of us were inside of his office, and those who couldn’t fit in were outside in the hallway. And we staged a die-in to demonstrate that people with disabilities will die with these proposed cuts of over $800 billion in cuts to Medicaid. And we’re not just going to sit around and be quiet when you’re proposing to kill us. AMY GOODMAN: So talk about what happened, how you organized. And explain just what ADAPT is, Stephanie. STEPHANIE WOODWARD: ADAPT is a civil disobedience group. We engage in civil disobedience after every other step doesn’t work. So we do meetings. We do advocacy in what people view as the polite way. And when that doesn’t work, we do civil disobedience to prove that we will fight for our rights. And ADAPT has been around for over 30 years. We started with fighting for lifts on buses, which, proud to say, we clearly achieved, providing more access to everybody throughout our nation. And now we mostly focus on long-term home- and community-based services, meaning that we don’t think that people with disabilities should be forced into nursing facilities just because they need help, or other institutions just because we need some help. We strongly believe that it is a—it’s a right to live in liberty, a constitutional right to live in the community. So we fight for community-based services. And the proposed bill would make significant cuts to community-based services. AMY GOODMAN: And talk about where you were, why you chose to target the senator you did, and then how the police responded to you and others in ADAPT. STEPHANIE WOODWARD: Well, as the majority leader, I think that Mitch McConnell was an obvious choice for us. Leading this bill that would take away our life and liberty means that you’re the person that we need to confront about this first. So, that’s why we chose Mitch McConnell. We stayed in his office. The people in the hallway were arrested first, mostly because they were the easiest to get to, I assume. And we were there for about an hour before they got to the—Mitch McConnell’s office and started carrying us out individually, as well. And the police were—the police were doing their job, but we were doing our job. And it just so happens that our jobs conflicted that day. AMY GOODMAN: So, President Trump, when he was running for president, talked about Medicare and Medicaid. I want to go to May 21st, 2015, when he was speaking to the right-wing outlet The Daily Signal. DONALD TRUMP: I’m not going to cut Social Security like every other Republican, and I’m not going to cut Medicare or Medicaid. Every other Republican is going to cut. And even if they wouldn’t, they don’t know what to do, because they don’t know where the money is. I do. AMY GOODMAN: So that was Donald Trump two years ago. Stephanie Woodward, explain exactly what the cuts are that are proposed in the Republican healthcare plan. STEPHANIE WOODWARD: So, what we’re seeing is over $800 billion in cuts to Medicaid. And for us in the disability community, that means that—nursing facility services are a mandatory benefit under Medicaid. Home- and community-based services, although they are oftentimes cheaper, are an optional service. So when states have caps or cuts to their Medicaid, what they have to do is get rid of their optional services first, because you have to do the mandatory things. So, for people with disabilities, what that means is, people who are living in the community will lose their community-based services and be forced into nursing facilities or be forced to live in the community without the supports that they need, leaving them in danger of losing their life or losing their liberty, depending on which way they choose to go. AMY GOODMAN: What exactly would happen to you, Stephanie Woodward, if this Republican healthcare bill became law? STEPHANIE WOODWARD: Well, I want to be clear: I depended on Medicaid until I was 25. I am not as dependent—I am not dependent on Medicaid at all right now. However, there are millions of people with disabilities who are. And I was part of this group because I won’t stand by and let my brothers and sisters with disabilities across the nation have their life and liberty in danger because of a bill. So, while I may not be as impacted, the people I love do. And the people I don’t know, but I care about their lives, will be impacted. And that’s why we all came together. There’s a very diverse group of us. And everyone would be impacted in different ways, but none of us want to see this go through. This is Democracy Now! When we come back, we go to Michael Lighty of National Nurses United to talk about single payer and what happened in California. It passed in the state Senate but then was pulled in the state Assembly. We’ll find out why. Stay with us. AMY GOODMAN: “Peligrosa,” “Dangerous Woman,” by Lila Downs, singing here at our Democracy Now! studio from her latest album, Salón, Lágrimas y Deseo. To see her full interview and performance, go to democracynow.org.